Well folks, I am so happy to say that I enjoyed Windwitch more than Truthwitch. Especially with the cliffhanger ending. Well played, Susan Dennard, well played. 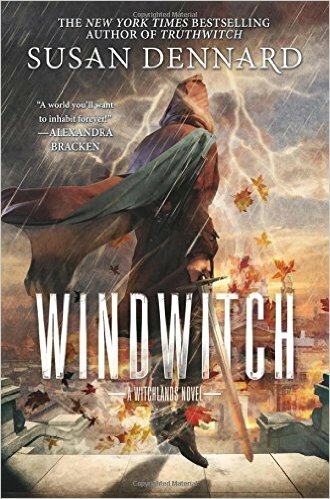 Where I found Truthwitch to be shaky and poorly organized, I thought Windwitch finally put me, as a reader, on the right track! The character development, plot organization and world building was stronger than the first book. The writing style does not vary from the first book, there are plenty of action scenes, overly descriptive passages and witty banter between the characters to keep readers entertained. It’s very apparent that there are a lot of moving parts with these books, and I think that Susan Dennard did a good job building on the platform that Truthwitch gave her. I know that she has said writing Windwitch was a very difficult process for her but I think it resulted in a slightly stronger novel than Truthwitch. Here’s the thing – Susan Dennard completely executed a huge dynamic shift from the first book to the second. Readers who were in these books for the ships are going to be disappointed because there is a lot more individual character development than relationship development. While I usually hate it when teams are broken, or ships are suffering from separation – THIS TOTALLY WORKED FOR ME. It may have to do with the fact that I was never interested or invested in any of the ships to begin with, so I really enjoyed the characters figuring things out for themselves without relying on their friends. As I had hoped, Aeduan and Iseult proved to be the most interesting characters in the book and I thoroughly enjoyed their storyline. Safi showed a lot of growth from the first book, which I also had hoped – I’m interested to see where she goes and how she develops. Merik completely fell flat for me, sorry. In all honesty, I’m not very interested in Merik or Safi at this point, but the third book could surprise me. At this point, I’ll likely read the third book Bloodwitch when it comes out solely for the purpose of finding out what becomes of Iseult and Aeduan. If you were a fan of Truthwitch it’s likely that you will enjoy this book. I think that Susan Dennard’s writing is wonderful – and I’m hoping to see a stronger third book in this series.